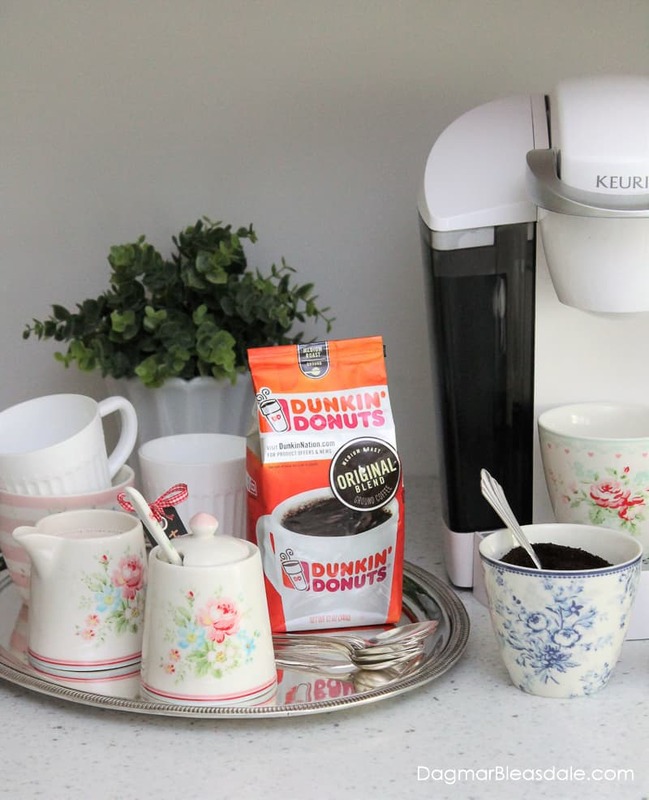 This holiday season, surprise your guests with a self-serve coffee bar and Dunkin’ Donuts® Coffee. 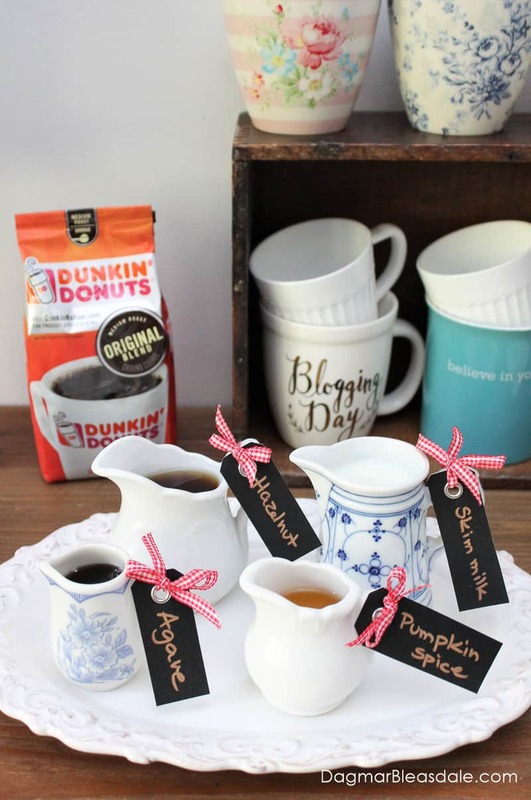 I love to entertain and create tablescapes, and today I’m showing you how you can set up a cute coffee station that lets your guests create their own coffee flavor combinations! 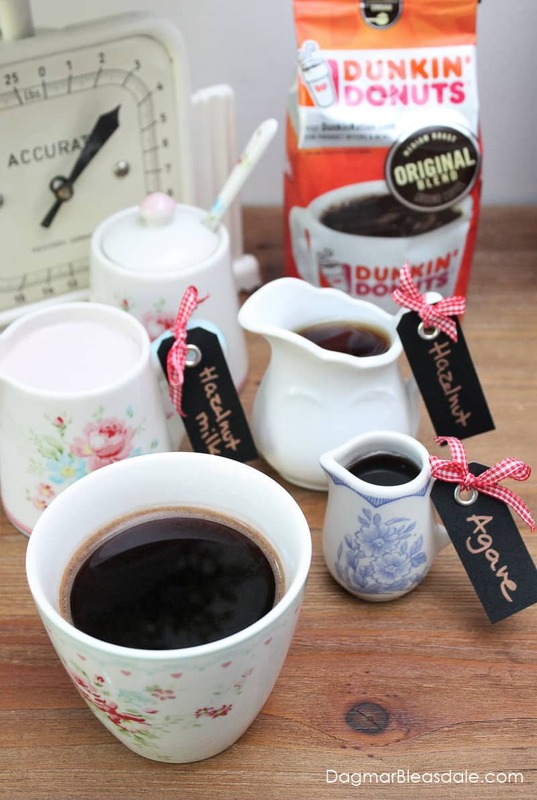 By offering many different flavors and dairy and non-dairy milk, it’ll be fun for every one of your guests to make their own coffee just the way they like it — or to maybe try something totally new. 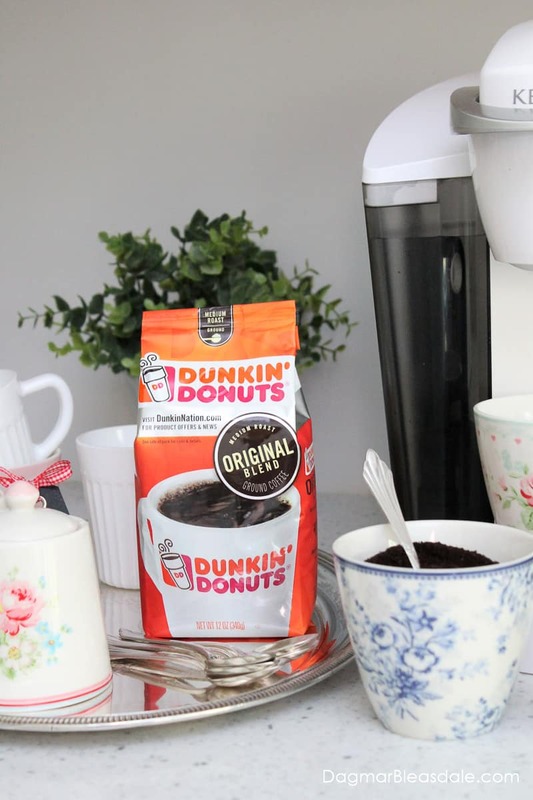 Dunkin’ Donuts is always a go-to option for yummy coffee, and I’ll tell you which flavor combination is my personal favorite. 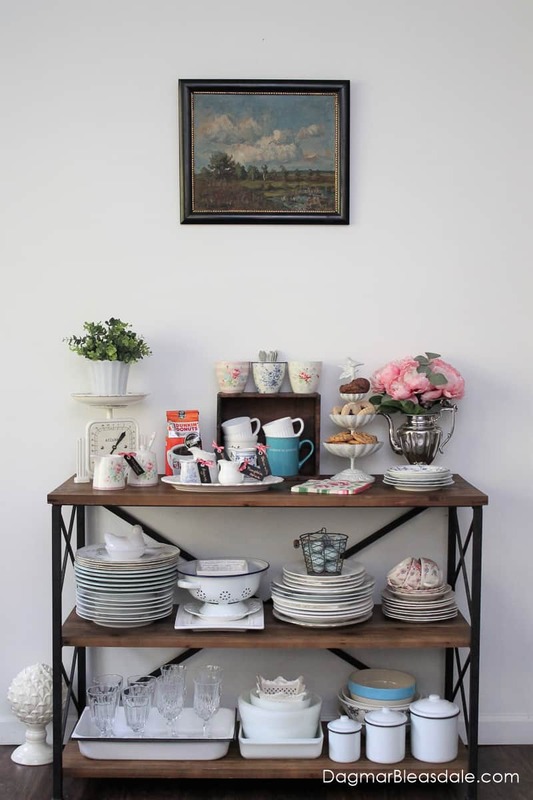 We have a great spot in our kitchen for a coffee bar — this console table I use to store a lot of my extra dishes. 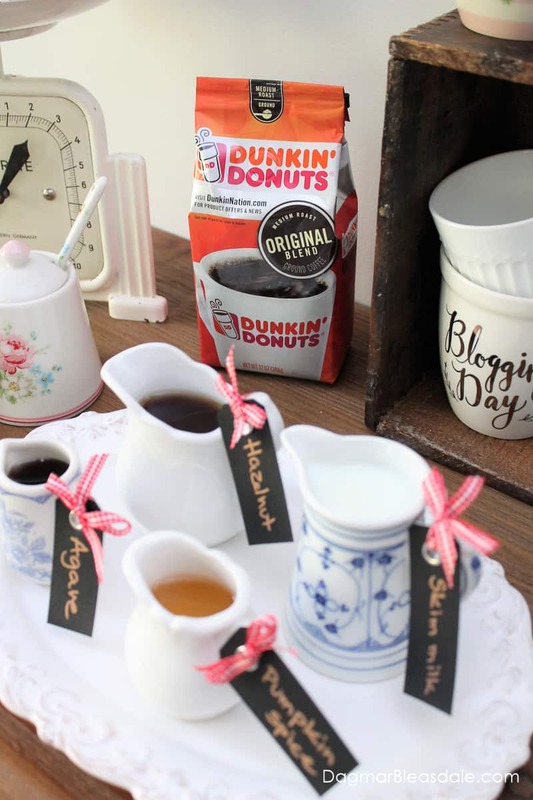 I bought Dunkin’ Donuts Original Blend because my idea was to let my guests have fun creating their own flavor combination by offering them many sweetener, milk and flavor options they can add. If you don’t have a table you can turn into a coffee bar — no problem. You can set up a smaller version of a coffee bar right on your kitchen counter. Here is one easy trick to make a coffee station look a bit fancy: silver trays. 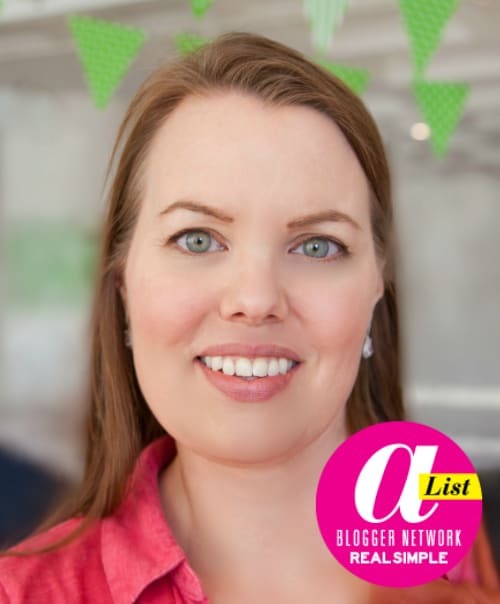 They don’t have to cost much — you can find them for just a few dollars at thrift stores — but they dress up any table setting or dessert bar or coffee station instantly. 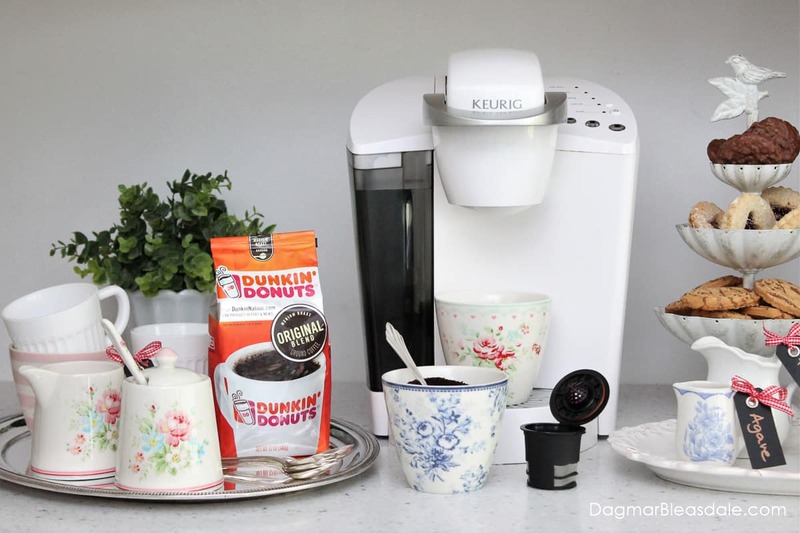 I use a reusable pod that I fill with coffee grounds — I find it takes just as much time to throw out the grounds as it takes to replace the K-Cup Pods, and it’s more sustainable. Are you wondering which kind of coffee I made with all of these possible options? I love anything hazelnut, so I added hazelnut syrup, hazelnut milk and agave sweetener together for a yummy coffee. 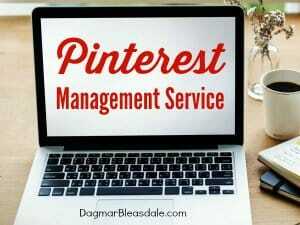 I hope this post got you in the mood to dress up serving coffee to your guests this holiday season! 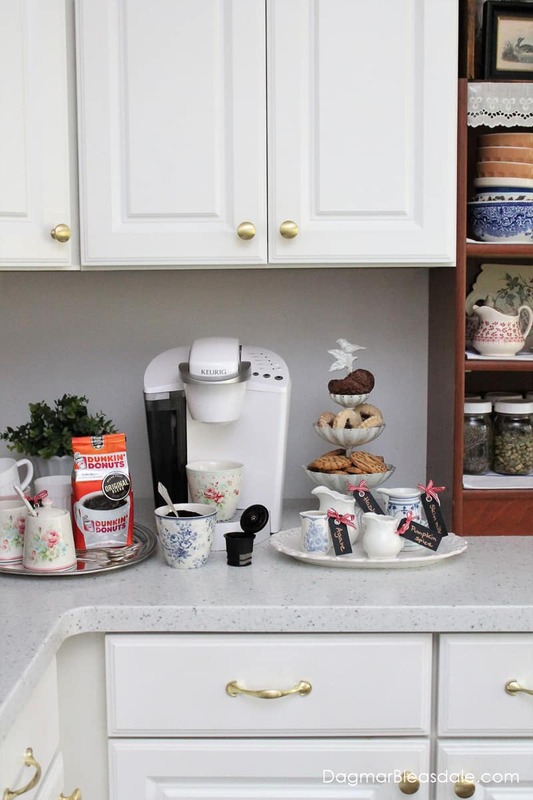 It’s so much fun to set up a coffee station with many little creamers, and it will be even more fun to see your guests be creative and enjoy trying different flavor combinations. Don’t forget to grab Dunkin’ Donuts at Walmart the next time you are there! Buy Original Blend to make your own signature drink when you entertain this holiday season, or some of their many other flavors that are available. This sure look fun and it helps get me into the holiday spirit! Thanks for sharing! 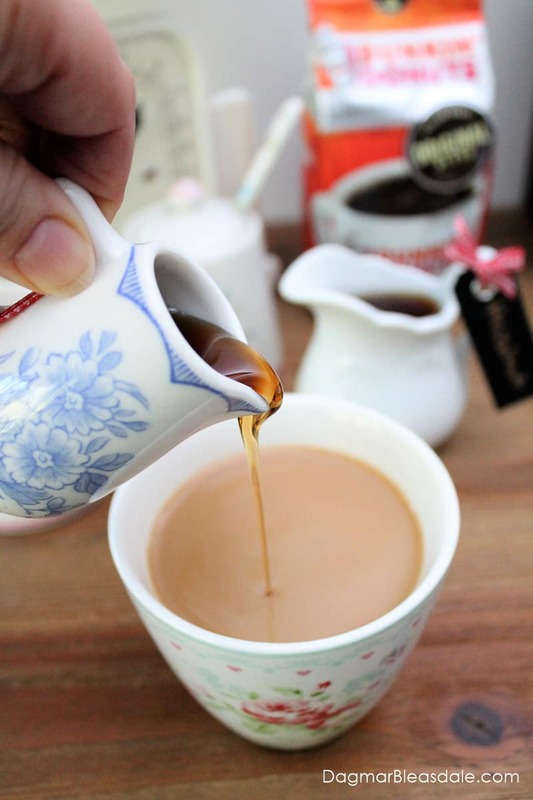 Love your china cups!